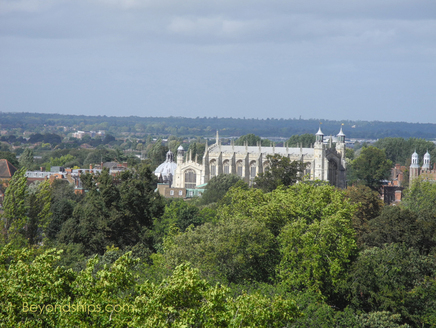 Above: Eaton College, one of England's most prestigious public (i.e., private) schools can be seen from the North Terrace of the Castle. Princes William and Harry attended Eaton. 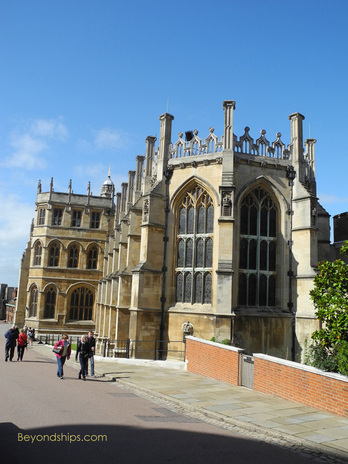 Above and below: St. George's Chapel. 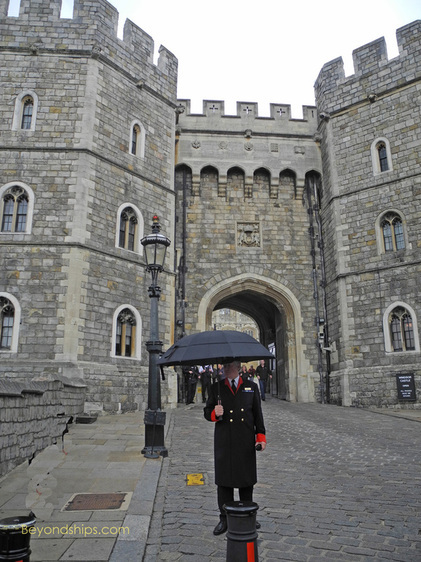 Above: A Guardsman of the Scots Guards on sentry duty at Windsor. Below: Visitors exit through the King Henry VIII Gateway. Above: The town outside the Castle gate. 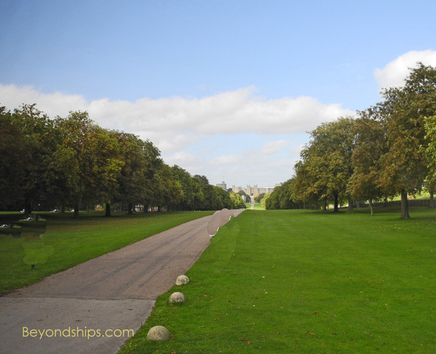 Below: The Castle can be seen in the distance down the Long Walk in Windsor Great Park. 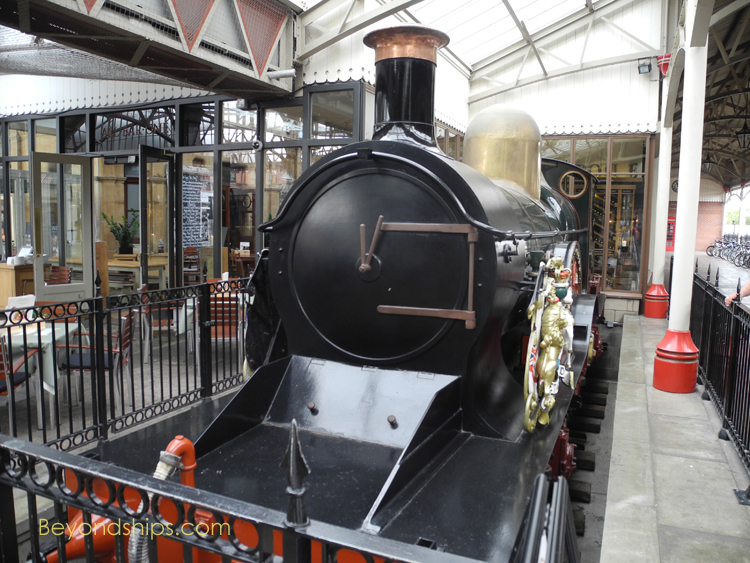 Above: A steam engine on exhibit at the Windsor railroad station. The above links are solely for the reader's convenience. Beyondships has no affiliation with the entities that operate these websites and is in no way responsible for those sites or the accuracy of any information contained therein. Another must-see feature of Windsor is Queen Mary’s Dolls House. Do not let the name mislead you. This has nothing to do with Barbie or Raggedy Ann. Rather, it is an amazing miniature version of a British stately home in the early 20th century. The story goes that Queen Mary, wife of King George V and grandmother of the current monarch, liked to collect miniature objects to decorate a small dolls house. Noticing this, Princess Marie Louise decided a fitting gift for this beloved Queen would be a dolls house designed and furnished by the foremost architects, artists, authors, and craftsmen of the day. A miniature Palladian country house was the result. The exterior walls rise up to reveal the interior rooms. On the walls are actual paintings done by the leading artists of the day. The library has tiny books written specifically for this project by the likes of Sir Arthur Conan Doyle, Thomas Hardy and Rudyard Kipling. There are miniature working copies of household articles and furnishings. Even the taps in the bathroom have hot and cold running water. It is a marvel how the people who worked on this project were able to create these miniature masterpieces. However, Queen Mary’s Dolls House is also fascinating because it preserves a way of life, a moment frozen in time. The people who worked on this project were trying to produce a miniaturized version of the world that they knew. Unlike the full-size royal residences and country homes, this house has not been updated and altered over the intervening years. Thus, it is a true representation of such a home during that period. Near the Dolls House is the Drawings Gallery. The Queen has one of the most extensive art collections in the world including not only paintings but photographs, books, manuscripts, drawings and prints. Items from this collection are shown in rotating exhibits in the Drawings Gallery. Dominating the lower ward is St. George’s Chapel. The name is somewhat misleading as this building is more like a small cathedral than a chapel. 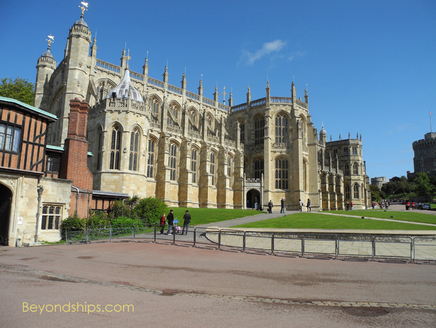 It is the final resting place of eight kings including Henry VIII and Charles I, who was buried here secretly after his execution by the Parliamentarians. Thus, it is a place with much history. It is also a visually impressive building. Begun by Edward IV and altered numerous times over the years, it has soaring ceilings and large glass windows. In it there is detailed wood carving and stained glass. You will also see some excellent examples of heraldry as this is the chapel of the Knights of the Garter. The banners of the knights and their coats of arms adorn the stalls where the knights sit during services. 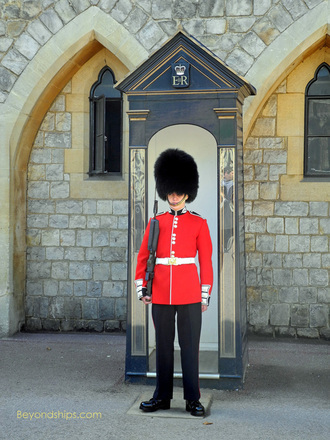 As you walk about the grounds of the Castle, you will see sentries wearing bright red tunics and tall bearskin helmets. These are not re-enactors but serving soldiers in the British Army. When they are not doing public duties such as guarding the sovereign, they do the same type of service including fighting for the nation. Indeed, they have a long and distinguished martial history that extends up to the present day. There are five regiments of foot guards and you can tell which regiment a soldier is from by the buttons on his tunic. Evenly-spaced - - Grenadier Guards; grouped in twos - - Coldstream Guards; grouped in threes - - Scots Guards; grouped in fours - - Irish Guards; grouped in fives - - Welsh Guards. You can also identify the regiment by the plume (or, in the case of the Scots Guards, absence of a plume) on their bear skins. During the summer months, there is a changing of the guard ceremony, each day at 11 a.m. The rest of the year, the ceremony is every other day. However, during the course of the day, you can see small groups of guards marching around the Castle as the various sentries are relieved. You exit the Castle through the Henry VIII gate, which brings you out into the town. There are shops and restaurants nearby. Although the town borders the Castle on one side, there is extensive parkland adjoining it on the other. Windsor Great Park is quite picturesque and includes many areas of interest that are open to the public such as the beautiful Savill Garden. Other points of interest such as Frogmore House where Queen Victoria is buried are only open occasionally. 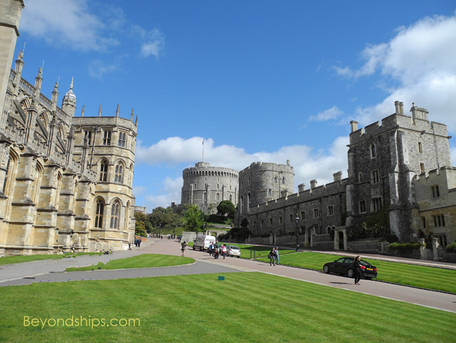 Some ships calling in Southampton offer a shore excursion to Windsor Castle. However, most cruisers visit the Castle as a day trip either before or after a cruise embarking from Southampton. Several companies offer motor coach tours to Windsor from London. But it is not difficult to get there independently. Trains run from London’s Waterloo and Paddington stations to the station in Windsor, which is practically across the street from the Castle. Admission prices vary depending upon whether the State Apartments are open. As of this writing, the price for an adult is 17 pounds sterling when they are open and 9.50 when they are not. An audio tour of the Castle, which lasts about an hour and a half, is included in the price of admission. There are also free tours conducted by Castle guides that last 30 minutes. 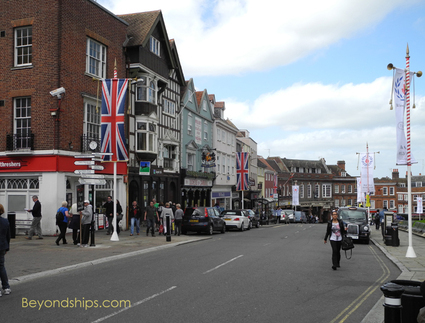 Windsor is a very popular destination during the summer. The crowds are significantly less in the fall and in the spring.